THE COLLEGE OF NEW JERSEY Graphic Identity Standards Guide 22 IDENTITY APPLIED TCNJ SCHOOL/DIVISION SITE A school or division's website is designed to showcase its unique culture and personality, while at the same time highlighting a clear connec- tion to The College of New Jersey. In 2015, the college began introducing a new site template which was designed with prospective students/ families and outside entities as the primary audience. The navigation and content on the homepage must be direct, concise, and digestible, giving the user opportunity to dive deeper into a particular topic. The school/division site home page template is modular. Required modules include: global site navigation, site title module, main navigation, billboard image slider, about module, contact module, and global footer. Additional module designs are available and may be added based on content needs for each entity. For many of the interior site pages, content on the page can continue indefinitely in length. However, best practices recommend keeping this length to no more than three scrollable pages. NAVIGATION The information architecture of the site allows the college community to navigate the site with relative ease without needing to understand the organizational structure of the College. Site main navigation bars may contain no more than six to seven items, and are not to exceed 65 characters with spaces. One-word navigation items are recommended. A "Home" navigation item is required for every site. These limits ensure that individual site navigation bars render properly across all screen sizes. With the exception of the "Home" link, a mega menu may be added to each main navigation item. These menus allow for up to four columns of links, categorized by subheadings. Each site must also include global site navigation, which includes a kick panel that contains main navigation links and main site search. 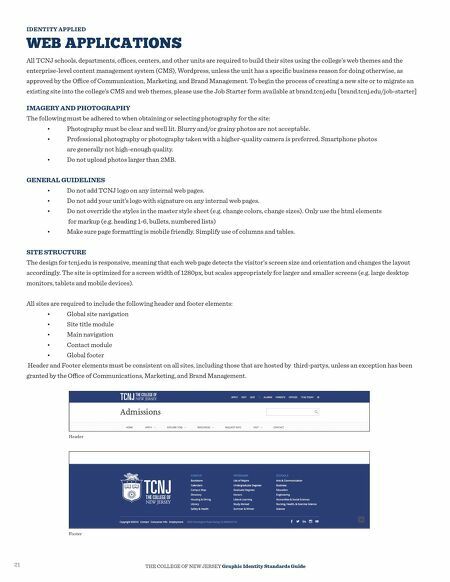 WEB ACCESSIBILITY All TCNJ websites and applications must be accessible by all users, including those with disabilities. While this is a requirement of the Americans with Disabilities Act, it's also good practice for web development. Web Content Accessibility Guidelines (WCAG) are developed through the W3C process in cooperation with individuals and organizations around the world, with a goal of providing a single shared standard for web content accessibility that meets the needs of individuals, organizations, and governments internationally. The WCAG documents explain how to make web content more accessible to people with disabilities. These standards address natural information such as text, images, and sounds. Developers can also see techniques for writing code or markup that defines structure, presentation, etc. 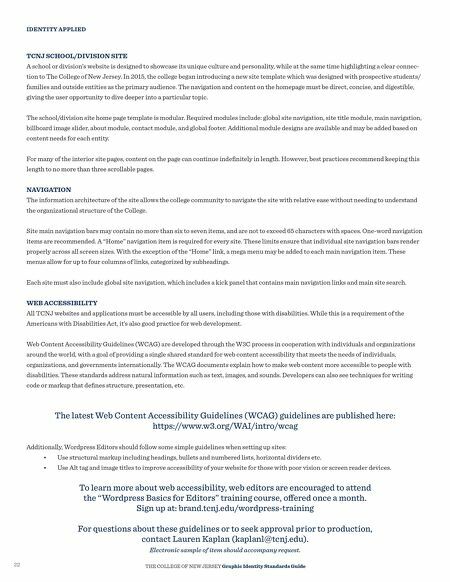 The latest Web Content Accessibility Guidelines (WCAG) guidelines are published here: https://www.w3.org/WAI/intro/wcag Additionally, Wordpress Editors should follow some simple guidelines when setting up sites: • Use structural markup including headings, bullets and numbered lists, horizontal dividers etc. • Use Alt tag and image titles to improve accessibility of your website for those with poor vision or screen reader devices. To learn more about web accessibility, web editors are encouraged to attend the "Wordpress Basics for Editors" training course, offered once a month. Sign up at: brand.tcnj.edu/wordpress-training For questions about these guidelines or to seek approval prior to production, contact Lauren Kaplan (kaplanl@tcnj.edu). Electronic sample of item should accompany request.